As you plan your dream wedding, you are probably thinking of where should you be getting ready. Philadelphia has numerous options for gorgeous getting ready locations. Kimpton Hotel Monaco is probably on the top of our list and there is a reason why. When photographing a bride getting ready on the morning of her wedding day in Philadelphia, we are looking for a few things. First, the light is very important. 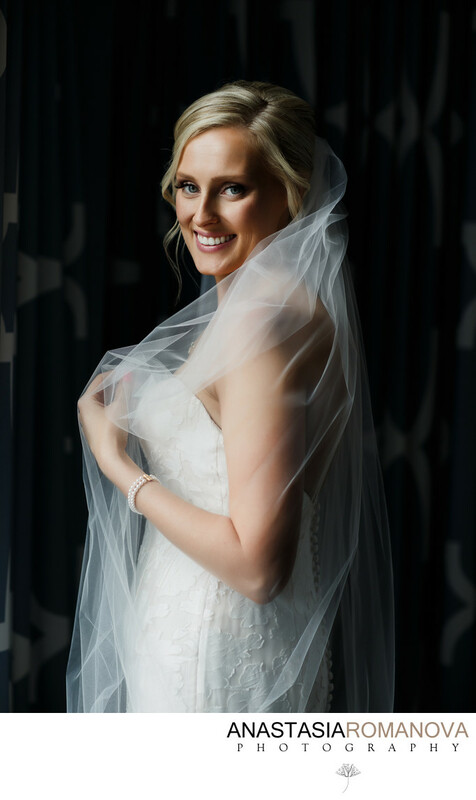 Yes, we can easily handle photographing wedding day preparations happening in the basement, but it is so much better to have some windows in your bridal suite. Natural light flatters the skin tones in a special way that cannot be recreated with any sort of artificial light. Kimpton Hotel Monaco in Philadelphia has some phenomenal suites with tons of natural light for brides and grooms to get ready. I love how spacious the rooms are. The dark navy walls work perfectly well as a contrast background. Another thing that is special about getting ready at Kimpton Hotel Monaco is the Philadelphia Old City views outside. They are simply breathtaking. Some of the suites are overlooking the Liberty Bell, The Independence Square, The Second National Bank of the Unites States, Thomas Jefferson Gardens etc. As Philadelphia wedding photographers, we love incorporating those landmarks into your photographs. It gives them the sense of space, time and tells your wedding day story in a more profound deep way.